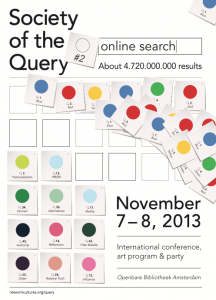 The Society of the Query #2 conference report offers an overview of the conference held November 7-8 2013 in Amsterdam. The file functions both as a summary and as archive of the project. It consists of the key results, the conference program, all conference blogposts and many other (research) blogposts concerning the topic of ‘online search and search engines’.